I talk a lot about social media and frequency of posting, in fact that IS a mainstay of my own personal business model. I still maintain 22 or more tweets per day, a few posts per day on Facebook, and multiple blogs a week (well it’s my goal that’s for sure). As someone who is hired to do this for corporations, big business and small, I understand the pace is difficult to match. But remember I have to do all these posts, tweets and prompts for myself too! A lot of the day to day questions I get are regarding strategy: online business social media strategy to be exact and I often address the answers in varying topics on this blog. However where is strategy if you just don’t know what to post? Strategy is nowhere, that’s where. You can’t start with strategy you have to start with the conversation. So in an attempt to provoke some inspiration on what to talk about when you have no idea what to talk about I thought I’d compile a few of my best “strategies” on social media writers block. 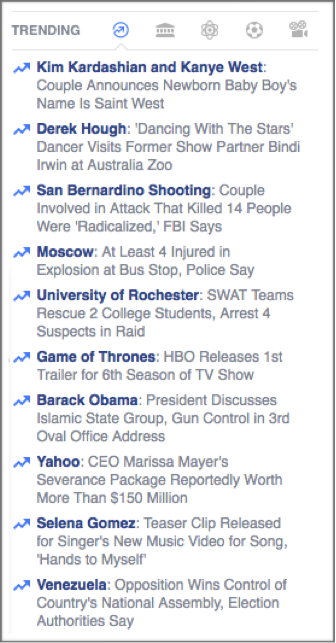 ONE: Always always always start with what is trending that day on your chosen social media platform. The day I am writing this (usually only a couple weeks ahead of when it actually posts) Twitter was trending with a really great topic: The Best Books of 2015. You can see everything that is trending that day and for how long on the lower left hand side of your Twitter home page. Anyone know why The Best Books of 2015 is such a great trend? Because there are so many different and interesting things you can say about it! And the list goes on. You can even create your own Best Books of 2015 and post that! Because everyone loves lists and your future clients want to know what you think. Not much positivity there, nor is there much you can focus on as a business. But hey this is where imagination comes in – have fun with it! Use the trend of Yahoo’s CEO severance package post and ask your followers what they would do with $150million. Ask if you should read the book or just watch the show in regards to the Game of Thrones post. Mention how much you love Dancing with the Stars and who your favorite contestant was? All of these are fun, inviting, add personality and also engage your audience while at the same time getting you more bang for the buck with each post. Every time you attach to a trending topic with a hash tag or subject you have a better chance of being found and read because more people are talking and reading about that very same thing! Make sense? TWO: I take a look at what my competitors are doing. What are your competitors talking and blogging about these days? What is on their mind and in their wheelhouse? Do you see a trend or a topic or two you haven’t covered yourself in awhile? Well then get to it and be inspired to write the best blog post or the most interesting Tweets this side of Tennessee! Today while researching this post I found a random list of the top ten social media blogs of 2015 (of which I am not on…YET!) So I decided to take a look at what these top ten had to say. This encouraged me to keep talking about LinkedIn and all my strategies because it was not being talked about as much, so from there I can stand out in the crowd. This research also showed me that maybe I could add a few new topics to my upcoming blogs such as how to create a great video to post to attracting sponsored content to using other platforms not included in the big 5 (Twitter, Facebook, LinkedIn, Pinterest, Instagram). THREE: Pay for a little help. 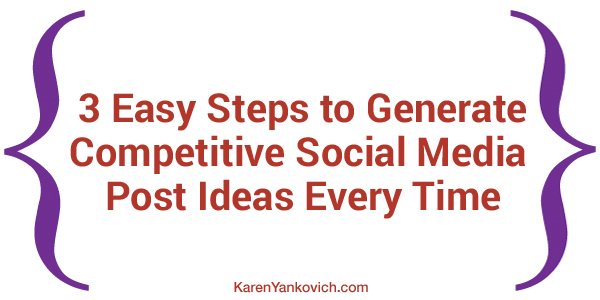 There are all sorts of tools out there that help you pick topics, popular posts, and viral trends to capitalize on when creating your own social media marketing and I won’t go into all of them here but sometimes all we need is a little leg up. There is so much content out there already one of the best ideas to get eyes on and likes on your page is to share posts that are the most popular already. Typically these are image driven posts, possibly with a quote or a video. One such application is Post Planner. Membership starts at $5 or $7 a month and if you have multiple business pages on Facebook this is definitely a plus for you. They have a tool called the Viral Photo Finder that will allow you to search pages in your niche that have posted a photo that has gone viral (number of shares in relation to number of fans) you can then share that photo which may prompt the same response from your fans. Photo credit is always given automatically when you click the share button. You can even add it to your scheduler queue right from there! Now I haven’t used Post Planner extensively nor am I an affiliate but I wanted to show you that there are options out there when you are stuck staring at a blank screen knowing you need to get something out on social media, but not sure what. Want to test out a post or a Post Planner Pick? Join me in my LinkedIn group and lay it on us! Myself and 600 other members will be there to help you out!